IF ONLY THE WIND WOULD TAKE A BREAK FOR AWHILE! 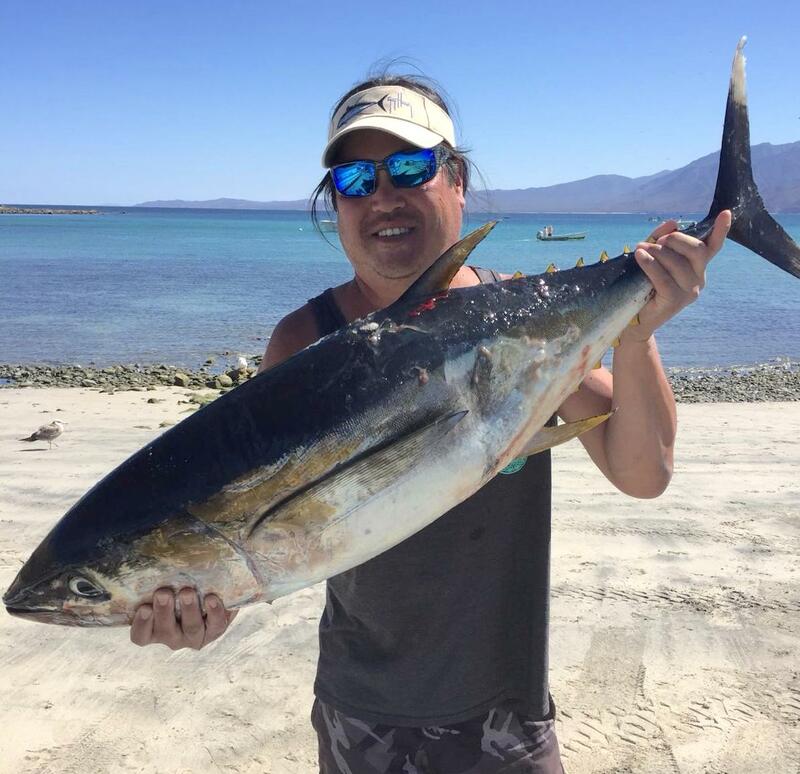 If there’s a fish, Kevin Shiotano usually finds one and it’s usually pretty respectable like this nice yellowfin tuna off Cerralvo Island. 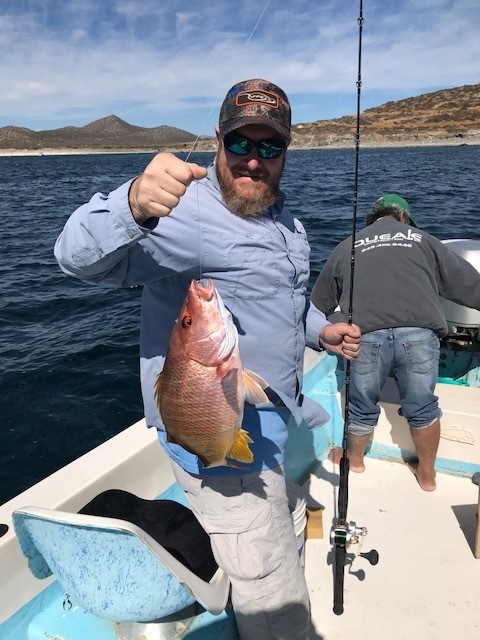 Some good eating huachingo for Dave Keene just outside of Bahia de los Muertos. It wasn’t a great week for fishing, but there also weren’t many fishermen either, which is typical this time of year. And for good reason. It can be rough and windy which is what we had this week. After a few nice weeks of fishable weather, we’ve now had about 3 consecutive weeks where the majority of days weren’t exactly conducive to fishing. On those days fishing was scratchy at best. A few snapper. Some small cabrilla and a few bonito at best. I suppose the good side is that the sun was out and the majority of folks who do come down this time of year are really just looking for a day to get out and most of our clientele this time of year are from cold and wet places. I always tell folks it’s off-season for fishing. On the other hand, on the few windows of time when wind and currents are not a factor, I’m surprised at the quality of fish out there, especially for this time of year. 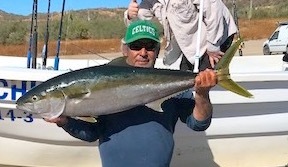 There’s some nicer grade of tuna; there’s chunky yellowtail; some free-swimming dorado and it seems like the big pargo liso (mullet snapper) are starting to spawn and school-up in the shallows. Denver…Sacramento…Seattle…Portland…Salt Lake City…Bakersfield…Boise…Long Beach and now…time to climb in the van once again! Long Beach is always a party with about 100 thousand of your closest fishing friends! 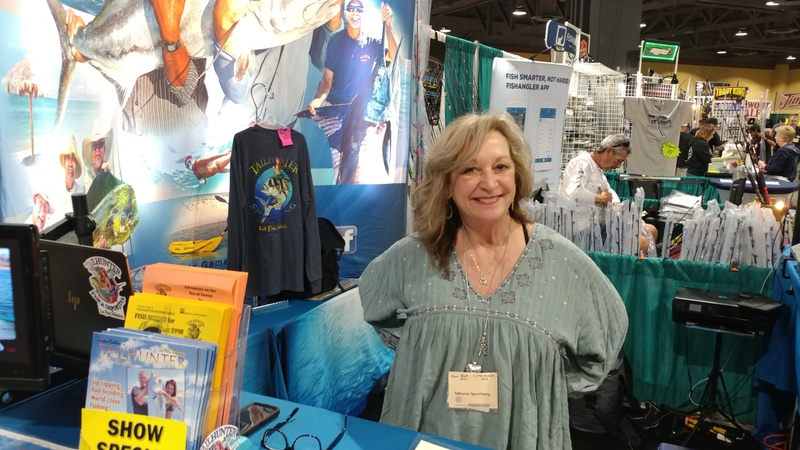 We’ve been on the road now since the middle of December and just finished up the incredible Fred Hall Fishing & Boating Show at the Long Beach Convention Center that just broke all kinds of attendance records. Jilly and I talked for 5 days straight without a let-up and it was off-the-hook! Thank you, Southern California and all our friends and Tailhunter Tribe for all the grins and high-fives! Jilly is all set up and ready to go! OK! But, how does he really feel? Nothing wrong with tacos! We really could use a week to recover! However, it’s onward down the road to our 10th show of the season. 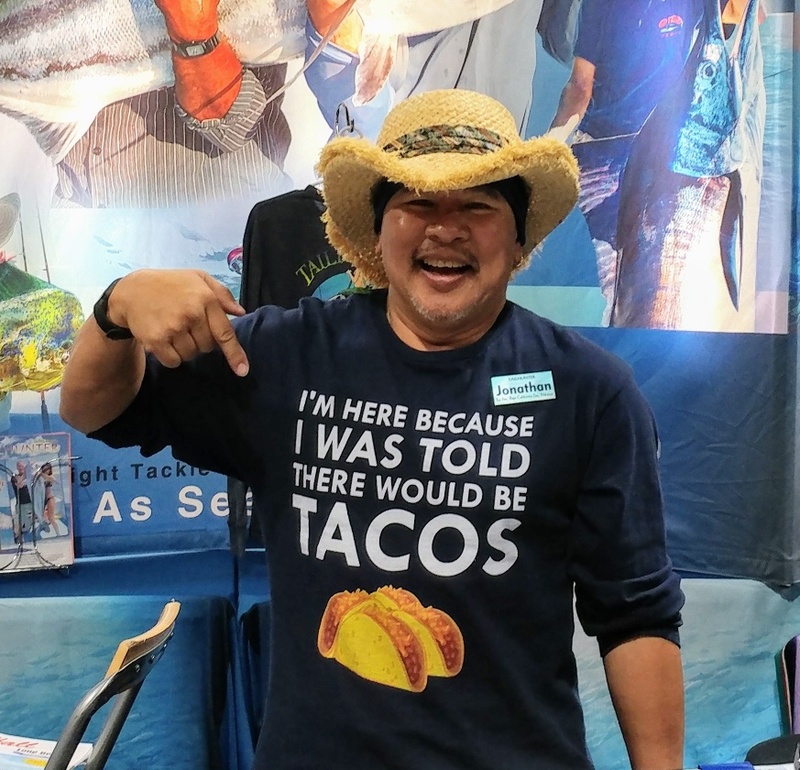 So, starting Thursday and going through Sunday, we’ll be at the SOUTH TOWNE EXPO CENTER for the INTERNATIONAL SPORTSMAN’S EXPO just outside of Salt Lake City! Always a great show and tons of things to see and do! Come down to see Jill and I and let’s chat about fishing in La Paz this year! What a grand birthday I had! Lastly, just a quick shout out to everyone for all the fantastic birthday wishes this past week. It just could not have been any better! I got hundreds of cards, e-mails, texts and visits from so many of you! You’re the best! 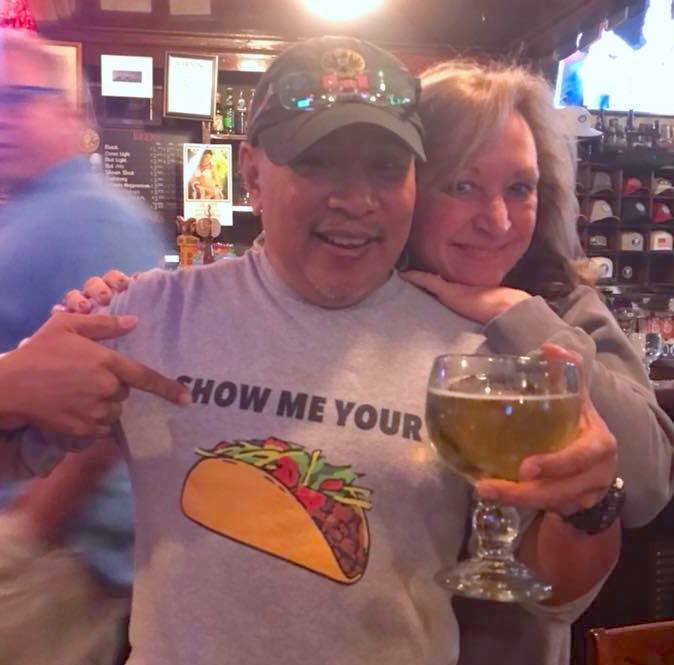 Also, to everyone who showed up to share some beer, pickled eggs, polish sausage sandwiches and way to many salty pretzels at Joe Jost’s Bar in Long Beach, you rock and I’m grateful and blessed and an even bigger thank you and love to my lovely partner-in-crime who makes it all happen and everyday like my birthday, Jilly!